Hollywood, California - May 26, 2010 – A new CD and digital collection of 14 Dandy Warhols standout singles and album tracks, plus one brand new song, will be released by Capitol/EMI in North America on August 24. To be titled The Capitol Years: 1995-2007, this is the Dandy Warhols’ first compilation release, spotlighting the influence the Portland, Oregon-based band has had, and continues to have, on modern music. 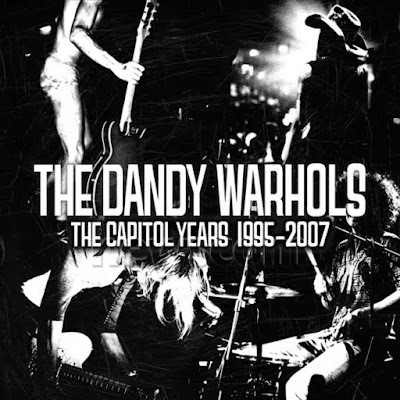 The Capitol Years: 1995-2007 is comprised of material culled from the Dandy Warhols’ four Capitol Records releases, The Dandy Warhols Come Down (1997), Thirteen Tales From Urban Bohemia (2000), Welcome To The Monkey House (2003), and Odditorium or Warlords of Mars (2005), plus a new song, “This Is The Tide,” which is exclusive to this release, and two tracks from The Dandy Warhols Are Sound (the long-awaited original mixes of The Monkey House, released in 2009), making it an essential addition to the Dandys’ recorded canon. The Dandy Warhols Come Down, the band's second album and Capitol debut, was released in 1996 in the U.S. and in 1997 in Europe . The album featured the hits "Boys Better" and "Every Day Should Be A Holiday" and showcased lush, layered guitars, otherworldly Velvet Underground-inspired spaceouts and sing-along rock anthems that were sorely lacking from the day’s grunge rerun-saturated rock radio. The band first garnered international attention with the world's catchiest anti-heroin song, "Not If You Were The Last Junkie On Earth." Thirteen Tales From Urban Bohemia followed, laying amplified elaborate guitar freakouts ("Godless”) atop the catchiest pop songs the Warhols had written to date. Trying not to sing-along with "Get Off" proves futile, while "Bohemian Like You" demonstrates that, in documenting the band’s subculture lifestyle in Portland, the Dandy Warhols succeeded in recording a manifesto for the modern hipster. This was the record that forever changed the band members’ lives; they now played to hundreds of thousands of rabid fans at festivals all over the world. In 2003, Welcome To The Monkey House showcased a fresh-faced Warhols experimenting with an ‘80s keyboard-driven sound. Fans commended the band for mixing the expansive organic and electro elements that today are viewed as having been particularly forward-thinking and relevant. Featuring the anthemic kiss-off "We Used To Be Friends" and the icy cool breakup song "The Last High," the Dandy Warhols stepped out on a ledge while staying true to the pop hooks and experimental sonic journeys they’d become notorious for championing. Odditorium or Warlords of Mars, thick with space-rock jams and sexed-up anthems, was the first album the Dandy Warhols recorded at the Odditorium, the band’s massive, newly-minted recording studio/practice space in Portland . The album echoes sounds first flirted with on early hits from their self-titled debut. “Holding Me Up" evokes every great rave-up they've written, honed to its sheer essence, while "All The Money Or The Simple Life Honey" cheekily winks at the band’s then-newfound freedom. In 2008, setting out on their own and acting as masters of their own universe, the band released Earth To The Dandy Warhols to great acclaim via the band’s new label, Beat The World Records. Last summer, they released the original Russell Elevado (a GRAMMY-award winning soul mixing engineer) mixes of Welcome To The Monkey House under the title The Dandy Warhols Are Sound, revealing the lo-fi, earthy nature of the record’s original surface. Today, the Dandy Warhols are in the Odditorium, playing, partying and continuing to perpetuate their own scene -- one that continues to hold a grip on music lovers the world over. That grip’s steadfastness is unsurprising: the Dandy Warhols just have this certain thing about them. They simply write some of the best rock songs of this generation.